Vinyasa (noun) - a steady flow of poses linked with breath and continuous movement. Vinyasa is a combination of basic and advanced poses focused on moving with breath and engaging your core. In this class, the teacher will create a sequence that breaks down many of the basics in vinyasa: breath, core, alignment and flexibility. Poses are linked together to flow with the breath. This class incorporates core-strengthening poses to support the body and provides folds and twists to counterbalance the spine. Hot Vinyasa puts a whole new focus on direct awareness buy using your breath and yoga as a tool for mindfulness. This synchronized and dynamic flow of basic and advanced poses focuses on the core to become centered. The sequence is built upon an arc of tension and release. By using 100% awareness on your breath, you will become present and create space from your busy everyday thoughts. Leave with a whole new connection to self: open, center and mindful. Class may include inversions and arm balances. The room is heated to around 90-95 degrees to help facilitate this integration of sweat, strength and spirit. This is a set sequence that works the entire body through balance, strength and flexibility. We guide you to utilize your breath to improve your focus, allowing your mind to become more clear. By combining the meditative properties of a set sequence with the power of heat and strengthening postures, you'll leave class feeling rejuvenated and balanced. Barefoot Barre is an all-levels, powerful, fun, high-energy workout that incorporates isometric muscle strengthening and sculpting. Barefoot Barre emphasizes total body toning and muscle endurance, using high-paced repetitive movements. This class incorporates classic barre exercises with weights, cardio and a yoga twist to improve your balance, flexibility and coordination. HIIT the Barre combines the toning benefits of a great barre workout, with the cardio benefits of high intensity interval training and finishes with the lengthening and stretching of the yoga poses you love. Short and sweet & so effective! In this 45 minute class, we’ll flow through yoga poses placing a little extra emphasis on our lower back and abdominals to build our functional core strength. We will also focus on harnessing our inner strength and explore ways to tune into our core being. A mind, body and spirit win! Calm and therapeutic in nature, this gentle flow class links poses, balancing ease and effort, to ultimately create inner stillness. Music, breath work (pranayama) and a variety of postures are creative woven to bring balance and peace to our day. 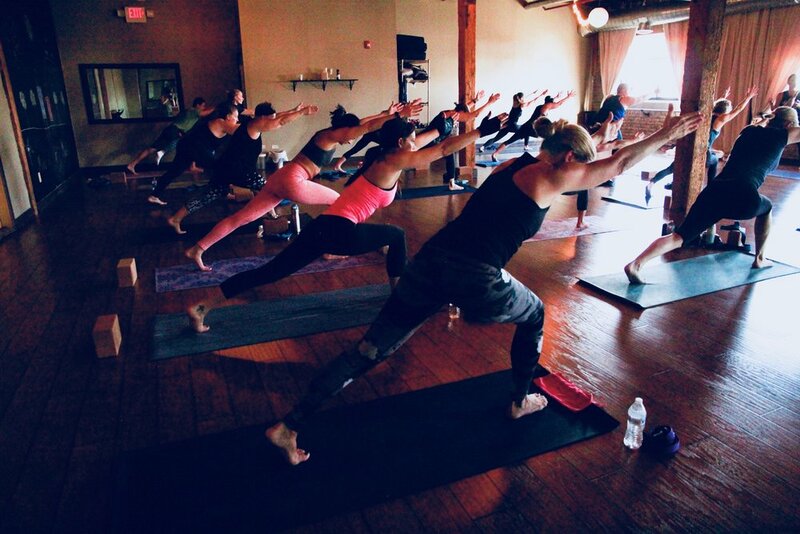 Like our Vinyasa classes, this class connects accessible yoga postures driven by breath and fluid movement for a balanced, well rounded flow. With a slower pace, there’s time to explore individual postures so that new students can build confidence and familiarity, while more experienced students can refine fundamentals of alignment and explore deeper sensations. Although the pace is slower, please come prepared to move, sweat, breathe and finally, to restore. Classes are held in a dark, candlelit studio, which is heated between 80-90 degrees. All levels welcome. A selection of restorative poses will support your body with props so the muscles, fascia and nervous system get to take a break from the daily grind. Restorative yoga uses props to hold your body in space while using no muscular effort along with guided relaxation in each session to help students release tension, enhance range of motion, and improve flexibility. This class allows you to unwind you mind and relax your body as we incorporate one of yoga's biggest benefits--Stress Relief! Anxiety and stress is something in which we can all relate. However, it's when it becomes chronic, we may not understand just how debilitating it is to our bodies, our minds, and even our relationships with others. Experience a variety of techniques including guided breath work, meditations, restorative poses and Yoga Nidra during this one hour mindful class. Incorporate this into your week, and begin to notice the subtle shifts that show up. We could all use a little reminder of what its like to feel simple and light again. **This special class will be open for ages 12 & up! Note: all other classes at Barefoot Yoga Loft requires ages 15 & Up. *All classes are subject to change--stay up to date with the latest schedule by downloading our Zen Planner App on your mobile phone.